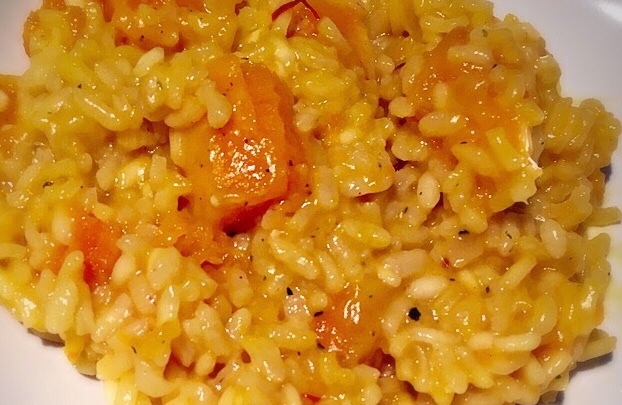 Today I am sharing my butternut squash risotto recipe. I am a true risotto lover and I just don’t understand how people can say it’s a hard dish to make! It is not hard at all. Time consuming? yes, attention seeking? Yes. Hard? I don’t think so. The trick is to add the stock one ladle at the time and to keep your eyes on it as you don’t want it to overcook or dry out. A perfect risotto can take as little as 20-25 minutes to cook properly. This is a recipe that I have made a few times and it’s perfect for these cold evenings, and windy days. This recipe makes 3 portions. Prepare your butternut suqah by seasoning it with salt and pepper and tossing it in a little olive oil. Roast it for about 30 minutes until it is very soft. In a pan melt 3/4 of your butter and add your minced shallots and garlic. Gently sweat them and once the onions start looking transcluscent add your rice and gently stir so that every grain is covered with the butter, add in 2 ladles of stock, the saffron and the salt and pepper. Let it simmer until the stock has been absorbed. Continue to add the stock 2 ladles at the time, gently stirring every few minutes. Continue until the rice is cooked through al dente, this should take no longer than 20-25minutes. You can start checking if the rice is done after the first 15 minutes. Once it is cooked, add in your butternut squash,drizzle the olive oil and add in your Parmesan. Stir well and enjoy hot.